Plan your approach – timing is critical when you want to explore a promotion. If you are in the midst of a critical project, or the company is undergoing a restructuring, you may want to consider when you can best approach your supervisor. However, it is also important to note that there is never a perfect time. Therefore, if you have a periodic check-in meeting, make sure to set aside some time then or ask for a separate meeting. Give yourself at least 15-30 minutes to have the conversation. You should begin by highlighting your excitement, commitment, and/or focus on the company/department, and discuss your desire to contribute even more. Demonstrate your added value – you should be able to provide evidence of why you deserve a promotion. Generally, it is easy to do so, when you are already functioning above your title. That is, if you are clearly handling duties that are outside your job description, and reflect more senior responsibilities, you can use that as proof of your added value. If you are not functioning above title, but feel you have been doing an exceptional job, compared to your peers, you should discuss those accomplishments, without criticizing your colleagues. Illustrate the benefit to the company – while many employers recognize the need to provide advancement, some may chafe at a request for promotion, seeing it as only beneficial to the employee. Therefore, you need to make the case that your promotion will be a win-win situation. You should talk about how you will be able to contribute to increased productivity, efficiency and the bottom line. Discuss your goals and vision for how you can tangibly enhance the company’s mission and bottom line. Counter any objections – be prepared to respond to any objections (e.g. not the right time due to a budget crunch, it would be unfair to longer tenured colleagues, etc. ), with concrete data (e.g. your sales figures, key projects completed, etc.). Leverage other opportunities– one method to strengthen your case for a promotion is to secure a competing opportunity. If you have been able to land a more senior role outside the company, it serves as further data to support your claims of your readiness to advance. During your promotion discussion, you may wish to raise this offer, as a leverage point. However, be careful of using it as a bluff (i.e. you have no intention of accepting the other offer), since your employer may call you on it, leaving you with the options of leaving or remaining with no promotion. Prepare for follow up– if the initial conversation results in a denial of a promotion, but you wish to stay in the company, you might ask your supervisor when you can revisit this discussion. If the conversation ends with a “let me think about it,” you should make sure to follow up at an appropriate time. 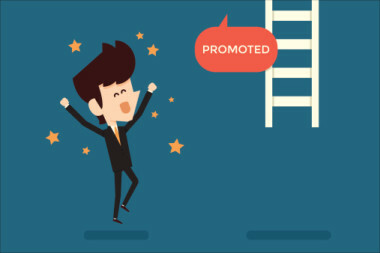 While asking for a promotion may feel a bit uncomfortable, you deserve the opportunity to advance, and you should be your best advocate for doing so. Practice with mentors or other trusted professionals as you craft your discussion to get that promotion!